Conspiracy theories exist for nearly every major event that has taken place around the world. Some of them are more ridiculous than others, but they all have followers who genuinely believe these ideas. Writer Dean Craig and director Antoine Bardou-Jacquet's Moonwalkers plays with one of the most famous of these conspiracy theories. Making its World Premiere at SXSW Film Festival 2015, the film has opened to mixed reactions. Regardless of critical reception, this film is an absolute blast from the moment that it starts until the credits start rolling. CIA Agent Kidman (Ron Perlman) is tasked with the mission of carrying out the plan to have the moon landing filmed by Stanley Kubrick in case the United States fails to make it to the moon. When rock music manager Jonny (Rupert Grint) successfully fools the agent into believing that he's Kubrick's manager, they must work together in order to fake the moon landing without attracting any unnecessary attention to their project. Director Antoine Bardou-Jacquet and writer Dean Craig have the clear goal of delivering on the laughs. There may be action elements sprinkled throughout, but it's all about creating humor out of the ridiculousness of Agent Kidman and Jonny's adventures. This is largely developed through the conflict displayed by the hippie culture and an authoritative figure. Similar to the theme found in last year's Inherent Vice. Kidman is forced to emerge himself in the culture that he has despises in order to complete a government mission, otherwise it could lead to dire consequences. Having fought in the war, he's haunted by visions of the destruction, which only become worse as he begins to work with the drug-obsessed hippies. Meanwhile, Jonny works as a music manager, but seems to fail in everything that he does. He owes a dangerous group of men money, and is forced to put on his biggest con in order to dig himself out of the hole. While certainly not a new dynamic, the high contrast between the characters is rather effective. The comedy formed between the two improves as the plot continues to become more insane. Moonwalkers has its flaws, but the characters certainly provide an entertaining display. Unlike the comedic aspects of the film, the action elements come and go. Agent Kidman has the potential to unleash a great deal of violence upon anybody who gets in his way. This side of the agent occasionally makes himself known, and when he does, Moonwalkers becomes absolutely bonkers. One of these scenes takes place in a bathroom, where one of the most insane sequences of the film unfolds. It only escalates from there, as Jonny continues to get them into situations that progressively become worse. As the stories of a manager and his band, an agent and the government, and a mobster and his gang collide, violence inevitably erupts in the most brutal ways imaginable. Craig's screenplay attempts to juggle these three plots, although they aren't all very cohesive. While the commentary on the moon landing is often hilarious, the mobster plot sticks out like a sore thumb. It makes for some high stakes for Jonny, although it simply distracts from the picture's greatest strengths as the story continues to play out. Once production begins on the moon landing shoot, Jonny fools his band into believing that it's actually the rock opera that they have been wanting to make, making for the perfect cover. There's a lot of good material here, but Craig's screenplay isn't quite able to successfully bring it all together. Moonwalkers is largely a film about revelations. Jonny and Kidman come from extremely different backgrounds, although this ultimately proves to be an emotional journey for the both of them that will inevitably lead to self-reflection. This proves to be the basis for both humor and sentimental moments. The laughs are certainly effective, although the emotional notes are a bit sour. Jonny finally comes to terms with the bad luck that has haunted him throughout his life, and Kidman is forced to confront his violent nature in order to truly be happy once again. Little do either of them know, each of their cultures are actually what they need in order to reach that point of realization. This ultimately makes for an ending that fits the overall tone, and satisfies the film's comedic and action elements, respectively. The characters don't experience much change, although they now have a slightly different perspective on the world that they wouldn't have had otherwise. The word-of-mouth for Moonwalkers may have just begun, but there are a couple big names to be found in the feature. Rupert Grint hasn't done much outside of his portrayal of Ron Weasley in the Harry Potter franchise, which certainly had me interested to see what he could do with a role like Jonny. This is a character that doesn't seem quite right for Grint from the surface, but he's actually rather good here. His comedic timing is decent, and his sentimental moment of realization is perhaps the most genuine scene in the film. Hopefully we will get the opportunity to see Grint take on more interesting roles in the future. Ron Perlman is exciting as Agent Kidman. He perfectly delivers an intimidating presence that proves to easily translate to the picture's comedic elements. It's pretty much more of the same from Perlman, but it's always a joy to see him in action. Some supporting performances from those such as Robert Sheehan in the role of Leon also prove to be successful. A large majority of the laughs actually come from the performances, rather than the screenplay. The newly-acquired Alchemy title will certainly be polarizing, although it's surely a lot of fun for those who are willing to be taken along this crazy ride. 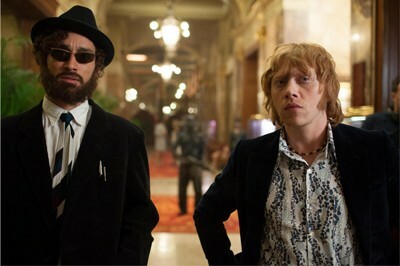 Rupert Grint and Ron Perlman deliver on a few laughs, and director Antoine Bardou-Jacquet has successfully incorporated the film's action elements. While we know where the film is headed pretty early on, Craig's screenplay manages to deliver the "popcorn flying" fun that audiences will be craving, even despite the film's issues. This is a title that will likely work best on VOD platforms, although it has potential for limited theatrical distribution in the United States. While engaging, it isn't exactly the most memorable feature of the festival. Moonwalkers is one of the guiltiest of pleasures. Recommended. Moonwalkers played at SXSW Film Festival 2015 on March 14th, March 17th, and March 19th. Order "Moonwalkers [SXSW 2015]" now!